Perhaps it’s his brilliance, wit and wisdom that makes us seek him out, but Troy McLuhan is one busy man. From his early work with the International SpaceFlight Museum to bringing the Naked Scientists into focus on Sunday Afternoons, he is endlessly busy creating a better life for us here. It is his restless search and great commitment to this outstanding Metaverse we inhabit that also makes it a better place. And we recognize this. It was fitting that the interview took place on Mars, above Kalepa. Pooky Amsterdam: You mentioned that a few years ago you presented a talk to the International SpaceFlight Museum, what year was that? Troy McLuhan: Well, I guess the first presentation would have been in June 2006. Pooky Amsterdam: Tell me about it please. Troy McLuhan: We’d invited someone from NASA Johnson to talk at the grand opening of the International Spaceflight Museum. Troy McLuhan: He’s a volunteer fireman and there was a fire….so I jumped in to give a talk in his place at the opening of ISM Spaceport Alpha sim. Pooky Amsterdam: You were last minute to present? Troy McLuhan: Yes, I talked about the International Space University. Pooky Amsterdam: Where is that? Troy McLuhan: (I’m alumni) I went to the ISU Summer Session Program (SSP). The ISU SSP is in a different city every year. Next year it’s at NASA Ames. Pooky Amsterdam: Always NASA then? Troy McLuhan: No, it’s been in Thailand, Chile, Canada, you name it. Pooky Amsterdam: What are some of the goals? Troy McLuhan: It’s multidisciplinary, covering the science, the economics, the policy issues, the engineering, and more. It’s also multinational, with about 100 students coming from all over the world. Pooky Amsterdam: What was the most important thing you got out of it? Troy McLuhan: I got a good sense of the space community out of going to the ISU. Pooky Amsterdam: How did this reflect in your talk you gave? Troy McLuhan: My talk in June 2006 was about 30 minutes followed by 30 minutes of questions. After that I gave a talk almost every week up till around Christmas. Pooky Amsterdam: Great so you were a hit. Did you feel any destiny in this? Troy McLuhan: I like giving presentations. Pooky Amsterdam: After the first talk, did you prepare a great deal, or speak more off the cuff? Pooky Amsterdam: When you initially started giving the talks you must have had some limitations in terms of presentation materials, how did you overcome this? Troy McLuhan: Space topics have the nice property that there is a ton of public domain images etc. Pooky Amsterdam: I was fascinated by your description of your building 3d models yourself, why did you take this upon yourself? 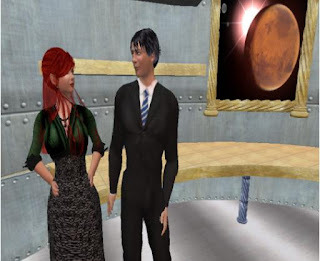 Troy McLuhan: My first big exhibit project in SL was a 3D model of the solar system. You can say a date on open text chat, and then the planets move to their positions on that date. I made that in November 2005. Pooky Amsterdam: I’m in awe. Troy McLuhan: I’ll show it to you sometime. Pooky Amsterdam: How much time do we have now? Pooky Amsterdam: 1) Why do you do this? Pooky Amsterdam: I think it is important to know where this incredible motivation comes from. Troy McLuhan: It’s about trying to understand the world, trying to figure it out. Pooky Amsterdam: & that must be what makes you so effective as you are also on the journey of discovery. Troy McLuhan: Aren’t we all. Pooky Amsterdam: Indeed! Troy I hope so, but some can take others with them more easily. It’s that x factor, you have it. Pooky Amsterdam: What was the first presentation you gave in school that made you feel really great, feel really the beginnings of this kind of journey for you? Troy McLuhan: We used to do public speaking competitions in 4H. Pooky Amsterdam: I had always wanted to be in 4H but I was a city girl, I used to read about it. Troy McLuhan: There’s 4H in cities too, but not as common. Pooky Amsterdam: Not in Greenwich Village…. Troy McLuhan: Most 4H clubs are farm related. Pooky Amsterdam: How old were you? Troy McLuhan: I don’t know. Pooky Amsterdam: & what was the presentation you did? Troy McLuhan: I don’t even remember the topics anymore. Pooky Amsterdam: Was it that people were really listening & learning something? Is that what made you happy? Troy McLuhan: I didn’t win. I think the best I ever did was come in 2nd place. Pooky Amsterdam: I guess it wasn’t about winning for you, but you will compete as you aren’t afraid to throw your hat into the ring. Troy McLuhan: I was in 4H mostly because my Dad wanted me to be in 4H. Pooky Amsterdam: You got more out if it though, you created something more out of it for yourself and I can think of a few metaphors for this. Troy McLuhan: We also had public speaking in school. Pooky Amsterdam: Did you like that? Troy McLuhan: I’ve always enjoyed public speaking I think. Pooky Amsterdam: That makes sense. Pooky Amsterdam: When we last left off- the Martian landscape was beneath us in a glow of its’ red aura, now we sit in a quiet place after the flight…. Pooky Amsterdam: When you were young, did you ever imagine yourself older as now doing what you are on space exploration? Troy McLuhan: Well, when I was younger I read a lot of science essays and books, the “popular” accounts, if you will. Pooky Amsterdam: Did you ever not take what was told you on face value? Or, how did this lead to your wanting to investigate on your own? Troy McLuhan: Well, I’m not sure anything led to me wanting to investigate things on my own. I did little experiments and things since I was quite young. Troy McLuhan: A parallel thing that’s important to understand is that my parents got us a computer for Christmas in the early 1980s. A TRS-80, you hooked it up to the TV as the screen. Pooky Amsterdam: They encouraged you then in this as well. Troy McLuhan: One of my brothers also got into programming, and it’s also a big part of what he does today. Pooky Amsterdam: & what did you find yourself doing with it in its nascent form? Troy McLuhan: We made some simple games, a wordprocessor, a map program. Pooky Amsterdam: It didn’t come with its own load of stuff or you had more interest in making your own? Troy McLuhan: No, the TRS-80 didn’t come with anything except a BASIC interpreter. You could buy games or software as cartridges to stick in the side. Pooky Amsterdam: Sure, but it must have been limited. Troy McLuhan: Yeah but it was fun. Pooky Amsterdam: It was the future- did you get any sense of that then? Troy McLuhan: Well, we knew it was new, but it must have given my dad quite a scare, because he never used one since. Pooky Amsterdam: He left that to his sons. Troy McLuhan: He was actually very suspicious of it, giving us very specific schedule when we could use it, as if it were a toy. Pooky Amsterdam: He knew more about 4 H, so in a way it is really a tribute to him that he wanted more for you. Troy McLuhan: I hated 4H. Maybe I didn’t make that clear. Pooky Amsterdam: Did you find those limits useful? And yes you did-but in that you pushed your 4H experience it to where it made sense to you. Troy McLuhan: And we weren’t allowed to use it during seeding or harvest, even for school work. Well, the schedule was also in place so my brothers and I could have our own times with it. Pooky Amsterdam: Did you fight over it ever, as kids will? Troy McLuhan: No we never fought over anything. Pooky Amsterdam: That is great. Troy McLuhan: Or if we did it must have been minor since I forget. Troy McLuhan: We also had school work to do, and chores, and hockey, and so on. Pooky Amsterdam: I guess your dad put that kind of thing into a schedule- a time for every purpose then. You played Hockey?? Troy McLuhan: Yeah, I hated hockey even more than 4H. At least I got *some* useful things out of 4H. Pooky Amsterdam: It has an innate elegance, the skating, I think. But you don’t seem to like anything forced upon you. Pooky Amsterdam: No, of course not, but I’m sure you have observed that some people are not leaders who know their own minds so very well. You do & seem always have. What was an early thing you determined for yourself? That was really yours alone? Troy McLuhan: I don’t have any good answer. Maybe nothing. Pooky Amsterdam: Okay interesting & re hockey- at least you know how to skate. Troy McLuhan: It’s of no use to me to know how to skate. Since I’ve been able to decide for myself what to do with my spare time, I’ve not put on a skate. Pooky Amsterdam: You have a very strong interest in space- when did that kick in? From the early science essays you read? Or more technical real things? Troy McLuhan: My interest in space is just part of my larger interest in the natural world and how things work. Pooky Amsterdam: so you have an equal interest in the microscopic? Troy McLuhan: Sure, of course. Pooky Amsterdam: You seem to have one foot so firmly planted in the future & yet are also drawn to the Victorian era. Do you think we need the past to find the future? Troy McLuhan: Well, I think it’s important to grasp that our human understanding of the world comes from people who lived and worked on it - on history. Pooky Amsterdam: On the shoulders of giants? Troy McLuhan: Yes, something like that. Pooky Amsterdam: Yes, time is a river, & for those who can plumb its depths a remarkable one. In that vein what of the great ancient engineering accomplishments are you most taken with? Troy McLuhan: I think the great pyramids at Giza are impressive. Pooky Amsterdam: What was the first thing you built that you felt really proud? Troy McLuhan: Most of the big things I’ve made have been software. For my PhD, I basically rebuilt an entire program twice. Pooky Amsterdam: A program for…? Troy McLuhan: For optimizing preliminary designs of spacecraft trajectories, where the spacecraft could use gravity-assist maneuvers and low-thrust engines. Troy McLuhan: That work was funded by JPL (Jet Propulsion Laboratory). Pooky Amsterdam: The ability to maximize thrust in outer space is very important, what do you think they should do with it? Troy McLuhan: Low-thrust engines are good because the key thing is to get the most bang for your buck (propellant mass). The “bang” is the speed of the propellant coming out of the spacecraft - and with ion engines, it comes out 10 times faster than with chemical engines. Pooky Amsterdam: & less cost & residual? Troy McLuhan: I haven’t done any work on that since I finished my PhD in 2004. Pooky Amsterdam: They have it now- you have moved on then? Troy McLuhan: JPL was going to hire me, but they didn’t get around to it, yet. There were budget cuts back in 2004-5 and also there are hurdles because I’m Canadian. Pooky Amsterdam: Their loss- talent is hard to come by. Would you like them to get back to you? Troy McLuhan: If they had an interesting project or problem for me to work on, then yeah, I’d be interested. Pooky Amsterdam: Do you think Canada will become more involved in space exploration? Pooky Amsterdam: 1) What would you like to build? Pooky Amsterdam: 2) I wish I built that……..
Pooky Amsterdam: 3) What intrigues you? Pooky Amsterdam: So those are my last 3 questions. Troy McLuhan: The things that intrigue me are how things work, especially “natural” things - like why do some butterfly wings change colour depending on the angle you look at them? Pooky Amsterdam: Oh Troy, some things should be a mystery! Pooky Amsterdam: To make us wonder, but then I could say well its camouflage or the layers of color changes on each ‘hair” on the wing producing a natural hologram effect.. Troy McLuhan: Well, one thing you quickly learn in this business of understanding things is that as you learn more, you realize you understand less than ever. Troy McLuhan: For question 2, I really admire some of the work of Aimee Weber, like her Tsunami build on the NOAA sim. Pooky Amsterdam: I guess the thing you would like to build, you are building. Anything you want say about the Lord Rosse project? Troy McLuhan: Well, it’s just one in a series of projects - all of which exist to help explain ideas in science, for reference, like an adjunct to Wikipedia, but also for education and entertainment. Pooky Amsterdam: Fantastic & that will spark much more science & thinkopedia. Troy McLuhan: No it’s *in addition to* things like Wikipedia, which is text, pictures, video and audio files. I’m adding 3D models, animations, narrations. Pooky Amsterdam: People will be drawn to that- I do believe people are tired of the dumbing down. That will really expand it then. Pooky Amsterdam: Wikipedia is very flat. Troy McLuhan: Wikipedia is already multimedia, but doesn’t yet incorporate all kinds of digital media. Pooky Amsterdam: Pretty mighty Troy and that really could expand a base of curiosity in so many important fields. Do you think there is any kind of fight for the mind of humanity now? Troy McLuhan: Is that a bonus question? Pooky Amsterdam: With you it’s all a bonus, maybe we should think on that one. Troy McLuhan: I’d rather not get into that - it seems a bit off topic. Pooky Amsterdam: I agree, another time then? The following is an interview we did over this past weekend. P: Am I supposed to be in a hushed state? Cause this is referentially gorgeous. P:P: you must have just fed them then, I have an important question for you- what do you think of my hair? Paradox Olbers: your hair look good! Paradox Olbers gave you Spindrift - zen bayou 3, Spindrift. P: only flies in in shllow water? P: why what did that give you ? P: why the outer regions of space? P: how long did it take you to find the science community here? & what were in your first searches? P: New World Notes is a terrific site, I would love to get Au on the show, think his element might be Gold. Great so you did the background research before the actual entry? P: did anything scare you about this new world? P: people play real life for quantity too & I ask is it a better one IDK? P: we are too much a part of the life we pursue here, too intensely involved with our own very real second lives. Paradox Olbers: well, I’m delighted so far - you’ve introduced the SpinDome to a whole new audience! What are your hopes for the sSpindrift isle? P: do you think that because we alreday suspend some belief in here that we are more opne to learning? Paradox Olbers: …and have huge fun and learning from it for myself and all of us here. P: & as we suspend our belief in that limitation we also suspend our belief that we are limited. P: how did he find you? Ever since, i leave the internet breadcrumbs out. And i try not to box myself in with unnecessary cages. Paradox Olbers: a few friends, yes, but they don/t have good enough vid cards [laptops have this prob] or think they’d spend too much time here. Paradox Olbers: oh look the flying fish again! Yes, more than 24 hours a day here is harmful. Paradox Olbers: not legally, and the time patrol arrests u.
Paradox Olbers: nod re policing -.- PKDick did that hilariously in “A Scanner Darkly.” Scanner Darkly is a 1970s classic about the agent assigned to himself. Be warned, [missing part-insert] this novel is a gloomy and moving look at what drugs did to PKD and his friends. P: There are certainly elements of that here, but leave that for another conversation. Thank you. There are a lot of Second Thought given to a day inworld. And many references which resound in the real world, as that is where I am originally from. I looked at my small exquisite writing desk yesterday, where I do a lot of writing for the show. I was reminded of Virgina Wolf’s famous book title, “A Room of One’s Own” referring to the need a writer has to have that place, that privacy to let the words be released in the freedom which it deserves. You cant really write with someone looking over your shoulder, and the more personal ones comments, the more a need for that privacy. It could translate to any work in progress, it is much more profound and easier to accomplish when you are free to work on it as you like. Freedom, privacy and time it seems are the foundations of creation. It occurred to me that this small house I cherish so much on SL, is my bastion of all the above, is the “room” I call my own, and I have transfered that which I love to look at and love to do into it. Because I can access it anytime I want as well, I carry it with me through out the day, and happily return “home” to work on what I have left behind in outworld travels. I realize in this above paragraph there is a lot of belief suspended, and those of you who do not know SL might actually be shaking your heads in disbelief. However, we as a species of human have our limitations, many are self imposed (I can’t do that), some are gravity imposed (can’t fly) and some are molecule imposed (can’t time travel or become invisible) I never thought of myself as Three Dimensionally restricted until yesterday when I was having my Second Thought. We actively suspend our belief in SL I realized. The screen is (Psst) flat, yet the world exists as a full 3D environment. Even though it looks completely “round” it is still a flat screen we are looking at, yes with depth of field, but not with any thing like a real third dimension. As if we are watching a screen, in the movie theater and accept this is “happening”, we also believe we are traveling, moving and walking through a dimensional environment. This is what I mean by we completely suspend our belief. We suspend our spatial belief initially, afterwards we suspend the belief in talking animals. Yet because we suspend or belief we also make other things happen for ourselves. In reality, we tell our minds what we can or can not do. When faced with a problem, we do not as readily suspend our belief, we hold fast to them. ” This is solid, this is real,” and we also tell ourselves at times, “this is something I can’t do.” We are in the real world, where we do not suspend our beliefs. 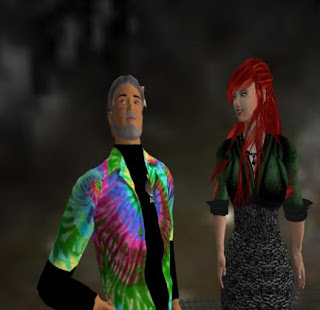 When we are in Second Life though, we have already suspended a lot of our belief structure, eg. I can fly. And it occurs to me because we have already suspended our beliefs in many ways of just accepting we ARE in this world, our minds are so very much more open to what we CAN do here. This of course includes learning. We have set far less limitations upon ourselves spatially, so we also set less limitations upon ourselves mentally. This makes it much easier to learn or master skills inworld and I have come to think that is why Second Life is such a great laboratory for education.